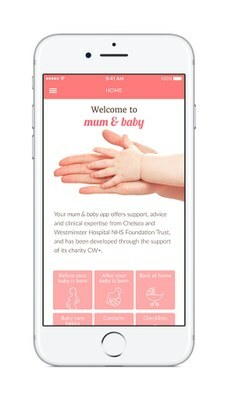 Hospital charity CW+ is delighted to launch the brand new version of our Mum & Baby app, providing new parents with reliable, up-to-date advice about looking after their baby and themselves. Mum & Baby offers access to national and international resources of relevant information, advice and guidance, validated by a team of NHS midwives and doctors, working closely with Dr Sunita Sharma (Lead for Postnatal services, Chelsea and Westminster Hospital). Pregnant women registered to have their baby at Chelsea and Westminster Hospital or West Middlesex University Hospital will also find information about their hospital stay, the team that will be looking after them, how to register the birth, and local children’s centres. The first version of this app has had 7,000 downloads with a 97% satisfaction rating from new mums. Version 2 was developed by working closely with mums, partners and the hospital team. It offers an easy-to-navigate screen, multiple links and videos of a range of useful topics—emotional and physical wellbeing, mental health concerns, advice for partners, preparing for labour, your stay in hospital, post-delivery care, baby care basics, mum and baby checks, recovering from different types of delivery and medical conditions and advice for when back at home. “The driving force for creating this app has been user surveys, which have repeatedly shown that new mums want more information. We therefore wanted to gather clinician-validated resource material into one place, and make it available in an easily accessible format,” explains Sunita Sharma. Mums and partners can download the app for free—it’s also available to hospital or healthcare providers throughout the UK and beyond, under licence. The app is co-funded by CW+ and digital healthcare experts Imagineear Ltd who also designed and built the app. Mum & Baby for iPhone and iPod touch is available on the App Store.